You don’t have to say goodbye to protein if you eat a vegan diet. Beans and lentils are a terrific way to get your protein, and quinoa is an even better option. This plant is a complete protein that contains all 9 essential amino acids. 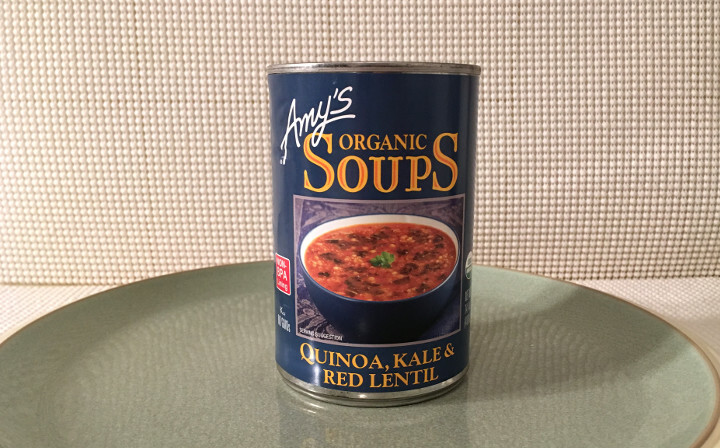 Amy’s Quinoa, Kale & Red Lentil Soup is a healthy choice for anyone who wants meatless protein options. 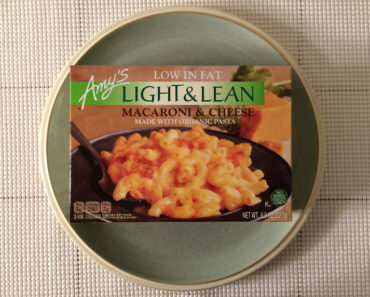 If you’re curious about why we’re reviewing canned soups on a frozen food site, our answer is simple: we were listening to Amy’s! 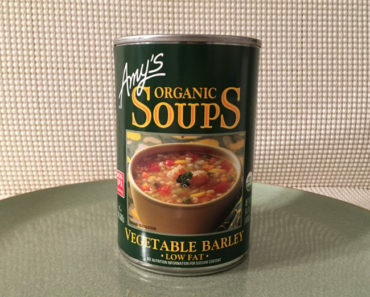 On some of their packages, we spotted a request saying “Look for us in the soup aisle!” We’ve followed up on that request and enjoyed several of their canned soups. The next time you’re in the soup aisle, we recommend looking them up. This canned soup couldn’t be much easier to prepare. 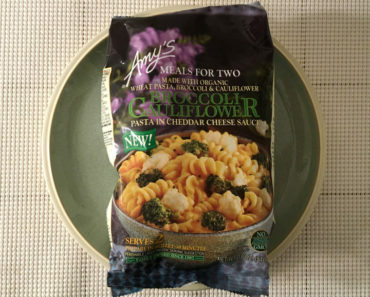 Open up a can, toss it in a bowl, heat it in a microwave, and you’re ready to go. Because the can has a pull tab, you don’t even need to use a can opener. When you look at this soup, you’ll probably notice the quinoa before you see anything else. However, even though this dish is loaded with quinoa, there’s actually another ingredient that dominates the flavor palette here: tomato. The broth is made with a tomato puree, and the taste is fairly strong. 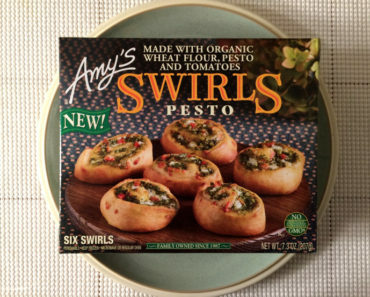 Ingredients like ginger, kale, and red lentils keep this from tasting like a standard tomato soup, but tomato haters might be displeased by this dish. As long as tomatoes don’t bother you, you’ll probably find this soup to be delicious. The quinoa has an appealing texture to it that’s more subtle than noodles. There’s a sprinkling of jalapeño in the soup, which gives it a bit of a kick. Spices like turmeric, garlic, and ginger give it a complex but complicated flavor. 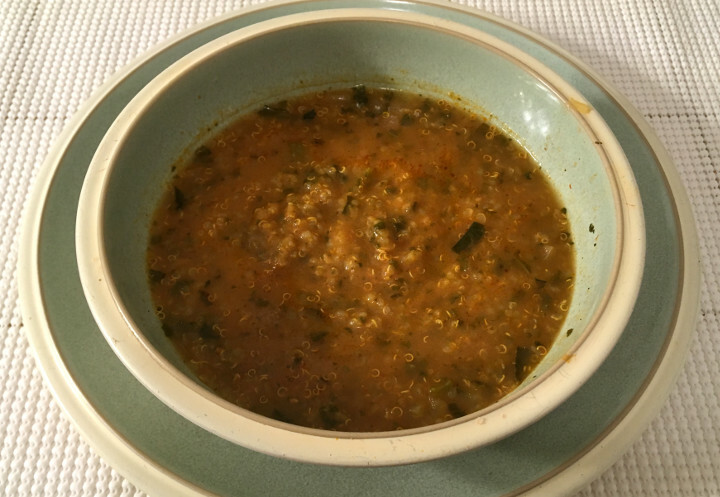 Amy’s Quinoa, Kale & Red Lentil Soup is a terrific option for anyone who’s looking to add more vegan protein sources to their diet. 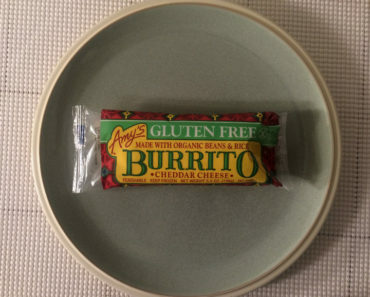 It’s filling and full of flavor, and it’s even gluten-free. 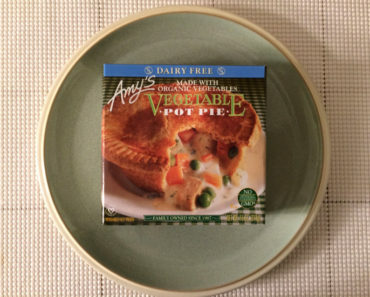 It’s not a soup for everyone, but it is an excellent choice for people with dietary restrictions. 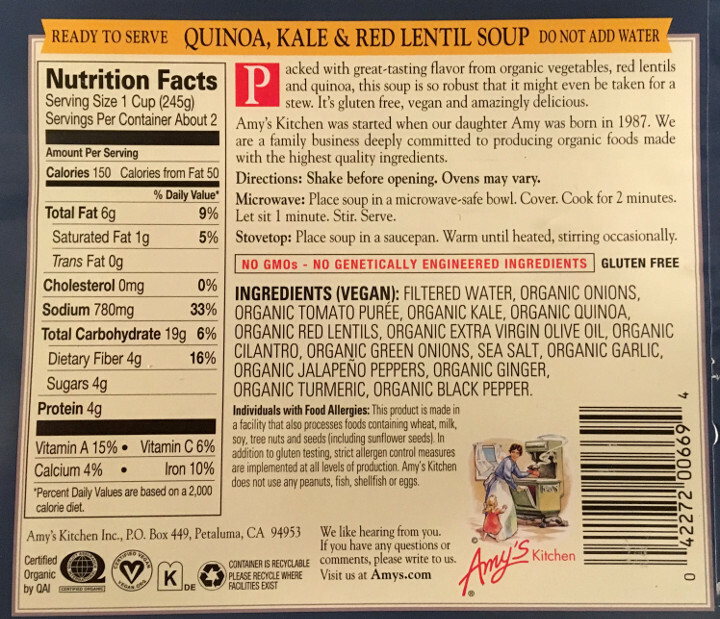 To learn more about the nutrition content, ingredients, or cooking instructions for this Amy’s organic soup, check out our package scan below.